Keep your home colorful and festive in the cold of winter. Select frost-proof containers – Choose fiberglass, metal, thick plastic, wood or stone containers at least 1 ft. deep. Winter’s freeze-thaw cycles may cause crackling in cereamic, terra cotta and thin plastic containers. Build a solid foundation – Start your container off with larger heavier pieces of greenery, such as spruce tips. The tips give the container height and stability and can act as a centerpiece. Place them near the outer edge of the container, and sink them into the dirt about 4 to 5 inches. Fill it in – Try adding about three other types of greenery with varying textures and colors into the pot, working in toward the center of the pot. Once you have a main structure, fill in with lighter materials like Norway pine, cedar and juniper boughs. These plants tend to spill over the container and help soften its edges. Gaps can be filled with boxwood. Attract the eye – Winter pots call for plenty of creative flair, so splash that greenery with a little color. 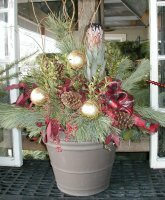 Embellish by using rose hips, red dogwood stems, colorful branches, willows, magnolia leaves, berries or prickly pinecones. Also, try adding mini lights. These will illuminate your container every night and add a holiday touch. Don’t be afraid to get creative with winter arrangements. Almost anything can be used in a winter container. Try these materials to help spark your creativity: spruce/fir tips, red twig dogwood, willow, berries/crabapples, grasses, pinecones, boxwood, cedar. You can even add a bow and silk stems to give the arrangement color and holiday flair.